What a brilliant way to put it, I thought to myself. It was the second week of school, and so far, Jack was looking pretty good. Every morning he packed his snack and gathered up his gym clothes and hopped on the bus without a look back. He came home happy and calm, full of exciting details about the day; the way his locker unlocked right away and he ate a sandwich from the cafeteria at lunch. But within a few days, the wheels began to fall off the bus. I guess I was still in summer mode, not really checking his homework folder too thoroughly, letting him handle his paperwork. Then last Tuesday was open house, and sitting in the airless room with forty other parents listening to the two teachers review this year’s expectations—things like taking notes and reading comprehension and something called Frindle—I started to panic. Take notes? How is he going to take notes? I wondered. “His issues seemed so widespread; could we really teach Jack to move the sound of a siren to the back of his brain and concentrate on his spelling instead? How do you increase a person’s theory of mind and help them understand that others think and feel differently? We’d moved from reminding him to make eye contact and notice a squirrel outside the window to trying to teach him that he can handle the sensation of a loose tooth. The next night I took all of his folders out of his backpack and organized his papers into piles. I opened his grammar book. “Jack, if I say ‘Joey, do you want more ice cream?’ what kind of sentence is that? Is it declarative or interrogative? Again and again I called him back, and he started to flap and flail and scream that he was done, he could not work anymore. Here’s the thing about Jack. He does not learn anything he doesn’t want to learn. I’m sure there is a big fancy term for this, but essentially, if he is not interested in the topic, he refuses to talk about it. Late Friday afternoon I sat down at the counter where he was writing something on a white sheet of paper. He bent his head over and gripped the pen. Watching him pore over the menu, drawing uneven boxes and crossing out words, I was swept by a tidal wave of tenderness and heartache so deep, I had to look away. “Jack, I am not mad,” I started to explain. But when I looked over at him, I could see he was already gone, lost to the world of Bisquick and chicken and meals. I am very conflicted about this; on one hand I want to wrap my arms and legs around him and keep him safe from the demands of the real world—taking notes and reading Frindle and rounding up to whole numbers. But I know if I do that, he will just stay right where he is forever, sitting at my kitchen counter trying to figure out what we should have for dinner on Tuesday. And he was so excited about fifth grade, that’s the thing. All summer, he could not wait to have a locker, to switch classes, to buy a sub for lunch. His naiveté about the whole transition pains me deeply. But there are certain realities I cannot overlook. His work is a mess, his handwriting barely legible. He’d rather cross-reference the price of snow cone machines on Amazon than figure out decimal points. He has no idea how to take notes—to listen to the words coming from the teacher, organize them in his own mind, and jot down the important points for review later. Maybe you’re thinking I should come up with better ways to discipline him–maybe take away his music if he doesn’t complete his reading log or tell him he can’t watch The Muppets unless he studies for his quiz. And we have tried all those things and more, with no success. It’s as if we’re asking him to cross the Grand Canyon using only a tightrope. Jack’s never walked on a tightrope. He does not know how to balance on one; to put one foot steadily in front of another without looking down. He would be very, very scared. And then we tell him that he can’t wear shoes while he steps across the thin wire. He can’t have one of those big long pole things to help him keep his balance. We take away all the tools that keep him calm and steady and focused. And when he stims and flaps and eventually falls, we scratch our heads and wonder why. “His issues seem so widespread; can we really teach Jack that a 36 is a terrible grade? How do you a force a person to work on round numbers when he keeps getting up from his chair and screaming and hitting his head? How can I get him to stop thinking about Maleficent and start thinking about school before he gets so behind he never catches up? Of course, we can modify. We can modify homework and modify the way he takes tests and modify so he types on a computer instead of writing with a pen. But one day I fear I will wake up and realized we’ve modified Jack right out of a degree. My son might not graduate from high school. This is very real. And if he does not graduate from high school, if he does not walk across the stage and accept a diploma the way his older brother Joey does one year before, he will be destroyed. Am I putting the cart before the horse, so to speak? Maybe. Lots of people think I am. They say stuff like he’s only in fifth grade, take it easy. But I have never been able to take it easy when it comes to Jack. Because it will be me—only me—who has to sit this boy down when he is seventeen and tell him. It is me who will have to watch his face twist in pain and frustration while his heart shatters. See, he may not learn the way the rest of us do, but that doesn’t mean he doesn’t know. Friday night I dreamed I was sitting on the floor trying to spell the word nourishment. I had a pen and four quarters. I wrote the letter ‘N’ in careful cursive, and then laid all the quarters down. I knew it wasn’t right, but I didn’t know how to fix it. I stacked the quarters up. No, that wasn’t it either. If only I had some dimes, I could use them to finish spelling. I woke remembering the dream; my rising panic, Joe’s confusion, the quarters stacked in an uneven tower. I lay in bed listening to the house awaken; Wolfie thumping his tail in his crate, Jack slamming his drawers shut, a toilet flushing down the hall. I kept picturing the muffin tin I longed for to help me spell nourishment, the way the overhead light glinted off of its shiny metal surface. It was the tools. I did not have the right tools to spell. Throughout the morning I thought about 8-year old Jack and 9-year old Jack, and now, 10-year old Jack. The thing is, we did teach him to do those things. No, that’s not right. We are teaching him those things. Every day we remind him to look in our eyes, and how Rose does not care for chicken fingers. And he just happens to be an excellent speller. It is an everlasting battle, this autism thing. No, that’s not right either. It’s an everlasting commitment, this autism thing. “His issues seem so widespread; can we really teach Jack that a 36 is not enough, to work for the 80 instead? How do I give him the tools to take the notes and write the sentences and round to the nearest hundredth, when all he wants to do is organize dinner? But we aren’t done yet. We will never be done. 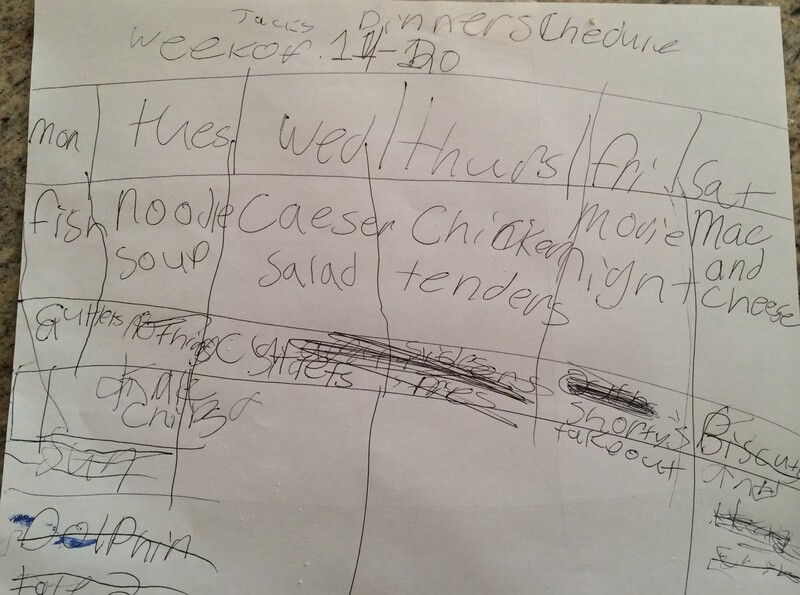 This is so beautifully written (as is his dinner menu:)). He even spelled Caesar correctly! What child does that? 🙂 There is hope. And my mantra is–one day at a time. Easier some days than others. I feel like I’m reading about my own son. His name is Matty and he is 10, he is in fifth grade and autistic. He is functional. VERY functional! But so many things escape his care. He can spell way beyond his grade level, always could. But to connect with the words deeply. To understand the academics that are being taught to him, with feeling and curiosity, beyond just facts and figures, well, that just doesn’t exist in his mind. Not like typical 10 year olds. I worry. I worry so much. Next year is middle school. And then high school. And it’s all getting more and more difficult. Sure, he doesn’t need help showering or toileting any more. But is he getting equipped for the world? I don’t know. And I don’t know exactly how to do it. And neither do “experts” or his educators either. Everyone is well meaning. But that’s not enough to make him succeed independently in this crazy world. I worry. Thank you for writing. I just found your blog through momestery and it’s good for my soul to read your story, Jack’s story. Thank you. This post makes me want to cry. It is so true and so well said. Handling autism for today is difficult enough but the reality is that our kids have to grow up and face the world and suddenly all that we do to prepare them may not be enough. My son is 11years old , entered middle school this year. I see him getting farther behind, I want to stop that from happening but I don’t know how either. I want him to graduate , but I know how you feel that it just might not happen. I worry, and overwhelmed too. All I can do is take one day at a time, and walk every step in this autism world with my son. Bless you, mama. I hear you. I am dealing with a different diagnosis. I am also overwhelmed. It is hard for me NOT to look at the future. I vacillate between taking one day at a time and curling into the fetal position. Each day, I awaken with new hope. It’s all I have, although it isn’t always enough. Thank you for communicating your thoughts and feelings so beautifully. I am sending good thoughts your way. Tears are streaming down my face. Relieved to know I am not the only one worrying if my 8 yr old will ever be able to live without me in this world… just today he went off to school with his shoes on the wrong feet because he insisted they felt better that way, and I didnt have the strength to continue arguing otherwise.